Thermal mass flow meters – what you need to know Here we are again! Ready to learn about a new type of flow meter? Have you heard of thermal mass flow meters before? This meter can measure many types of gases, and some models work in liquids too. 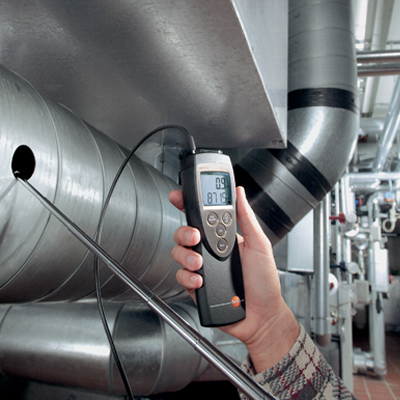 Courtesy of ndreport.com You’ll find thermal mass flow meters in a lot of compressed air applications because they work great for that. Here we are again! Ready to learn about a new type of flow meter? Have you heard of thermal mass flow meters before? This meter can measure many types of gases, and some models work in liquids too. You’ll find thermal mass flow meters in a lot of compressed air applications because they work great for that. Of course, some vendors won’t agree, recommending their own devices instead. But as I like to say, there is no perfect device. So you can use different principles to measure the same thing, as long as you know the pros and cons. Today we’ll discuss the principles, applications, requirements, and advantages/disadvantages of the thermal flow meter. Stick with me until the end of the article, and I’ll have a special surprise for you! The market offers two principles for thermal meters. Some vendors will carry both and some just one. However, you need to know how they work and how they differ to choose the right one for your application. You’ll find devices based on thermal dispersion and others that use thermal profiling. Let me give you more context about each, then we can review some examples on the market. Here the meter will have two sensors, one heated and the other unheated, in contact with the product. The heated sensor does the detection and the unheated stands as a reference, with both of them connected through a Wheatstone bridge arrangement. Now, we have two types of device for this principle. In one, the heated sensor has a constant current. If you have variation, then the resistance will change. You’ll see a correlation between the temperature (resistance) and the product flowing in the pipe. You can easily install this meter if you pick the insertion version rather than flanged. The meter will measure the mass flow directly, and you can measure different gases and mixtures as well. Usually, you’ll have a database with the gases you can measure, but in some cases, you may need to calculate mixtures. On the other side, this principle applies the heat to the flow instead of a sensor. You still have two sensors, but they’ll measure the change of temperature in two areas. Usually, you’ll install the sensors at the inlet and the outlet after the heating system. When you have zero flow, you’ll see the same temperature in both sensors. But with flow in the pipe, it creates a temperature difference proportional to the mass flow, which the sensors will read and the meter will translate for you. Now that you know these principles and how each measures mass flow, we should discuss design. Because each principle must have a particular design to work, and you need to know how those work too! If you have large pipes and don’t want to cut them to install a meter, then maybe you can use an insertion thermal mass flow meter. This one’s easy to install and comes in different sizes. To find the total mass flow, this meter factors in the flow rate, compensation, and cross section. When you scale out a new insertion meter, make sure you check the insertion length in your pipe. I’ve seen measurement problems where the customer had the wrong length. Here, we have two names for the device. You can call it a bypass flow meter or a capillary tube flow meter. This type has a laminar flow element, with the capillary tube installed at the inlet and outlet of the flow element. The capillary tube houses the entire system, from the sensors to the heating element. However, you may find variations on this theme, with some vendors offering two heating systems and up to three sensors in the capillary tube. These flow meters combine with flow controllers and a final element to control the sensor. You get it all as one device. As the most straightforward type of flow meter, you’ll find this device commonly used in research applications. You can get it in a variety of designs from simple to complex. And the fine wire sensor comes in materials such as nickel, platinum, and tungsten. Here I’ve listed a few of the pros and cons of thermal mass flow meters. Maybe you have more to mention? Feel free to add your input!